Particle air pollution in South Asia - especially across the Indo-Gangetic basin in Northern India, Pakistan, Nepal, and Bangladesh - ranks among the most severe in the world. In India alone, hundreds of millions of people are exposed to PM2.5 concentrations an order of magnitude greater than World Health Organization guidelines. However, fundamental aspects of our understanding of particle air pollution in India are incomplete. To inform policies to reduce exposures and improve public health, we are investigating the emissions and physicochemical processes that affect particle concentrations and composition. Our research includes field- and laboratory-based experiments and modeling studies. Ambient fine particulate matter (PM2.5) levels in Delhi, India rank among the highest levels routinely measured in any city in the world. Annual average PM2.5 concentrations in Delhi are roughly 150 µg m-3, or about 15 times higher than WHO guideline concentrations, and respectively 8× and 1.5× higher than levels in Los Angeles and Beijing. High PM2.5 levels in Delhi are driven by a combination of unfavorable local meteorology and an unusually diverse mixture of local sources. PM sources in the Delhi area are numerous and incompletely understood, but include light- and heavy-duty vehicle traffic emissions and associated road dust, solid fuel combustion for heating and cooking, biomass and waste burning, thermal power plants, diesel generators, construction, and small-scale local industries (e.g., brick manufacturing). Current projects include: (i) chemical composition and source apportionment of ambient PM in Delhi, and (ii) performance evaluation of lower-cost PM monitoring techniques. 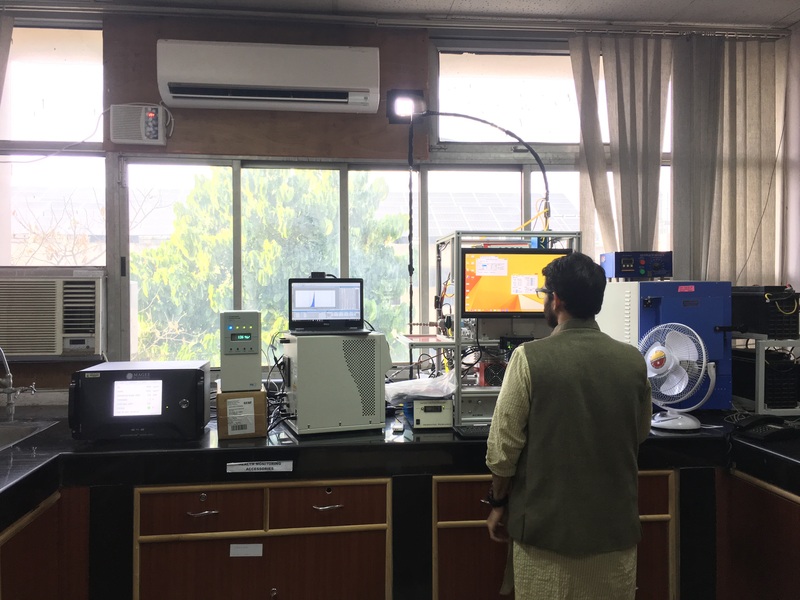 In collaboration with the Indian Institute of Technology, Delhi, we are investigating the sources and chemical composition of the ambient submicron aerosol (PM1) in South Delhi. Our online measurements consist of particle number size distributions (via scanning mobility particle sizer), black carbon concentrations (via aethalometer) and non-refractory PM1 composition (via Aerodyne aerosol chemical speciation monitor), all collected at 1-5 minute frequency. Using positive matrix factorization (PMF) receptor modeling, we are investigating the local and regional sources that contribute to Delhi's high background concentrations of PM1. (With Prof. Lea Hildebrandt Ruiz, Chemical and Petroleum Engineering, and Gazala Habib, IIT-Delhi). 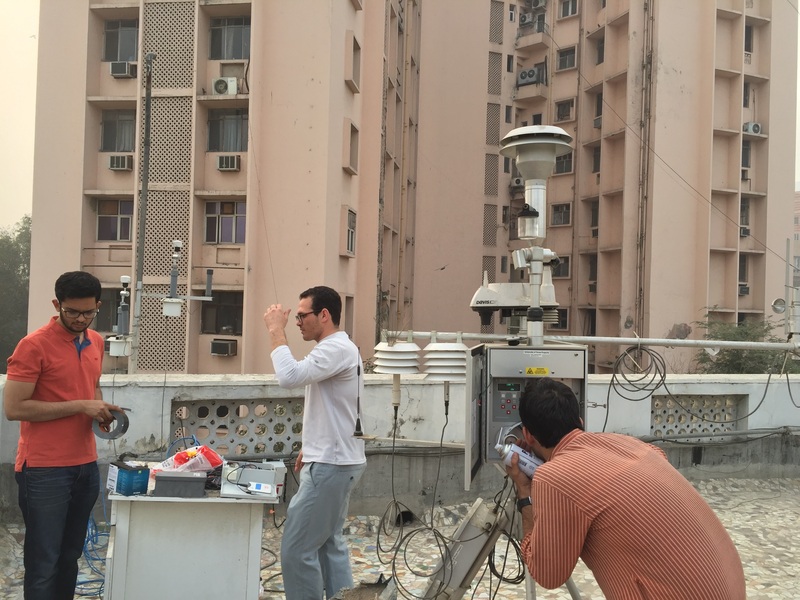 Lower-cost air pollution sensors have the potential to fill critical air quality monitoring gaps in India and other developing countries. However, few sensors have been rigorously evaluated for their performance in Indian conditions. High PM mass loadings - and the high abundance of fresh combustion emissions from traffic and biomass burning - pose measurement challenges for some lower-cost sensor designs. We have established a fixed monitoring site with reference instruments in order to evaluate and calibrate lower-cost pollution sensors. (With Prof. Jesse Kroll, MIT). One important source of air pollution exposure for Delhi residents is time spent in vehicles: many commuters spend 1.5 - 2 hours each day in transit. 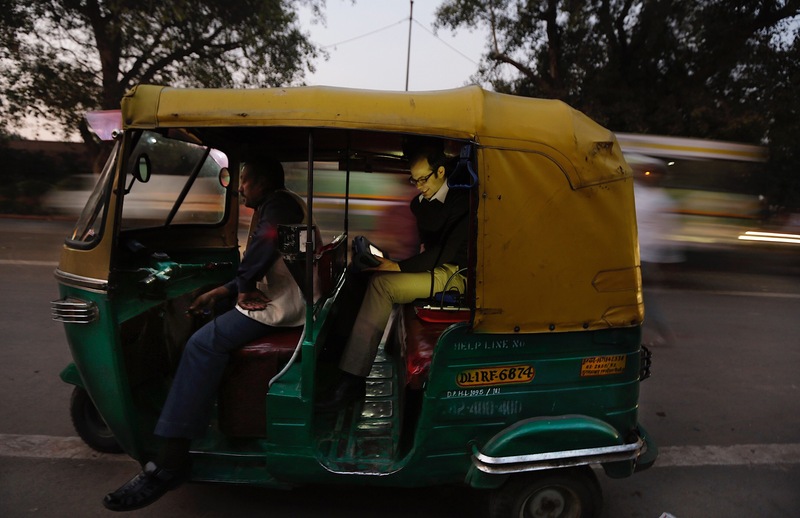 We conducted an intensive field campaign to measure concentrations of fine, ultrafine, and black carbon particles inside cars and auto-rickshaws in New Delhi. Our measurements showed that particle concentrations in vehicles were 1.5 - 8 times higher than in ambient air. The measured concentrations are among the highest ever reported for a routine transportation microenvironment.